Mike Pence is a Certified Public Accountant who is thrilled to be a part of the team at Canton Country Day School. Mike desires that his background in accounting be used to serve the students, parents, and staff of our wonderful school. Mike has spent over 40 years in the field of accounting since graduating in 1976 from The University of Akron with a Bachelors Degree in Accounting. His varied experience includes work in public accounting and in education. 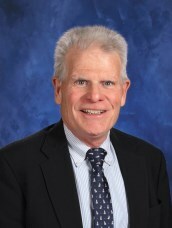 Mike was a local school district treasurer for over 25 years before retiring in 2009. Mike also teaches accounting and business classes at Stark State College. Mike has been married to his wife Lynn, a registered nurse, for over 40 years. Mike and Lynn have three grown children and are the proud grandparents of Lorenzo and Adora. Mike and Lynn are blessed to serve together in prison ministry. Mike is a commissioned chaplain of The First Baptist Church of Jackson. Mike enjoys spending time with his family including his dog Roxy, reading, and riding his bicycle whenever time permits. He has participated in many biking tours in the western United States and has ridden in both the American and Canadian Rockies. He still dreams of riding his bicycle cross-country.